Israel Antiquities Authority reported on excavations it is carrying out prior to construction of the extension of highway 6 north of Beersheva. Remains of a settlement that extends across more than six dunams were uncovered in the excavation being conducted in the fields of Kibbutz Bet Qama. The site seems to have consisted of a large estate that included a tower, a church, residential buildings, presumably an inn for travelers, and storerooms, a large cistern, a public building and pools surrounded by farmland. Also found was a stone with a Byzantine cross in secondary usage. It seems to me that this would be a good candidate for a monastery. The public building was a large hall 12 meters long by 8.5 meters wide. 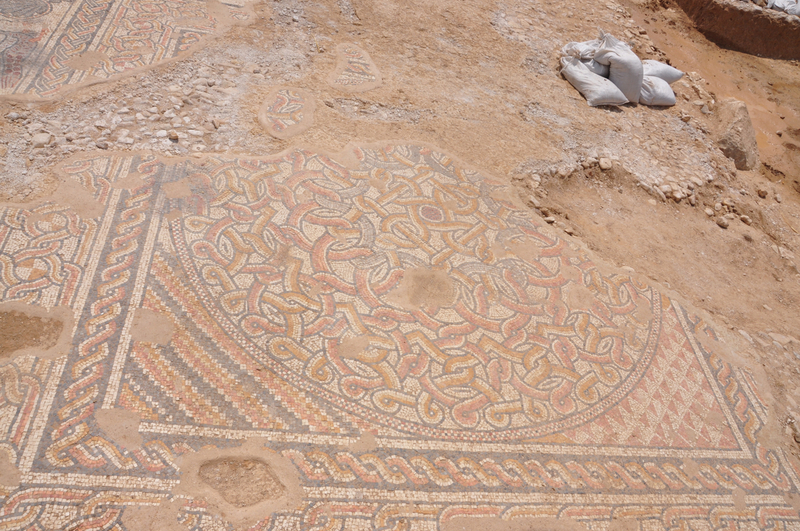 A spectacular colorful mosaic dating to the Byzantine period (4th–6th centuries CE) was exposed in recent weeks. 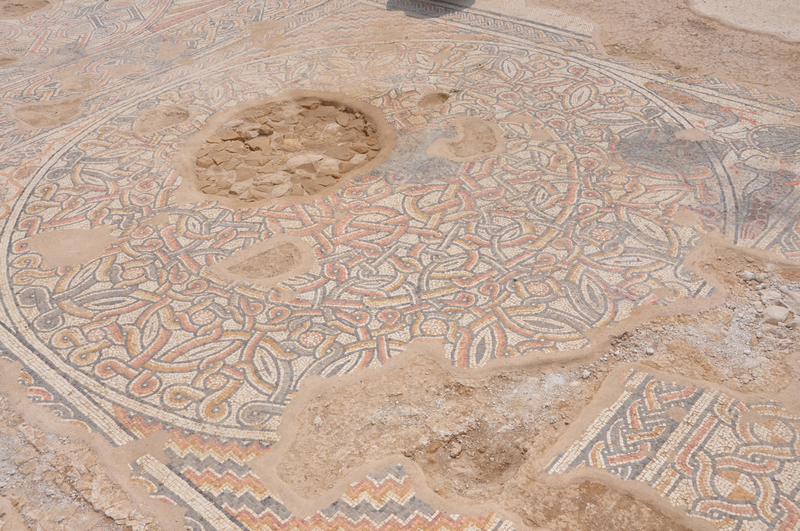 The well-preserved mosaic consists of 3 square sections each surrounding a circle decorated with geometric patterns. One has amphorae (jars used to transport wine) in two opposite corners, one with a pair of peacocks, the other a pair of doves pecking at grapes on a tendril. These are common designs that are known from this period; however, what makes this mosaic unique is the large number of motifs that were incorporated in one carpet. Pools and a system of channels and pipes between them used to convey water were discovered in front of the building. Steps were exposed in one of the pools (not a ritual bath, miqve, according to IAA) whose walls were covered with multiple layers of colored plaster (fresco) implying that whatever the pool was later used for, it continued for some time – no theory about what it might have been used for. Archaeologists in the Antiquities Authority are still trying to determine the purpose of the impressive public building and the pools whose construction required considerable economic resources. No destruction layer was found, the site was vacated in the Early Arab period. 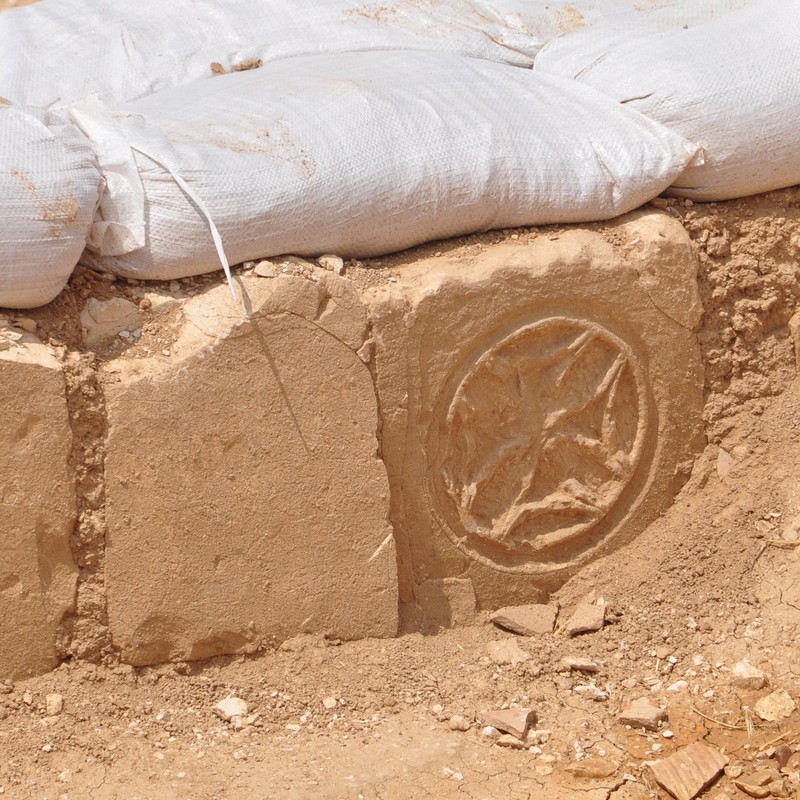 In other excavations nearby, two Jewish settlements were found. At Horbat Rimon a synagogue and miqve were exposed. At Nahal Shoval the remains of two Jewish ritual baths and two public buildings were uncovered. Both of the public buildings feature raised platforms along the walls facing Jerusalem, a feature of Jewish synagogues of the period. 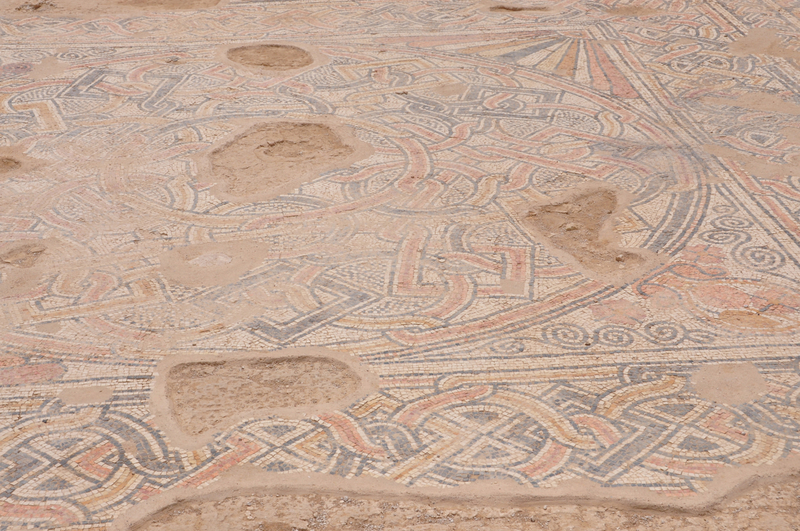 This entry was posted in Archaeology, Mosaics and tagged Beersheba, Byzantine, Israel Antiquities Authority, monastery, mosaic floor, synagogue on May 16, 2013 by Shmuel Browns. 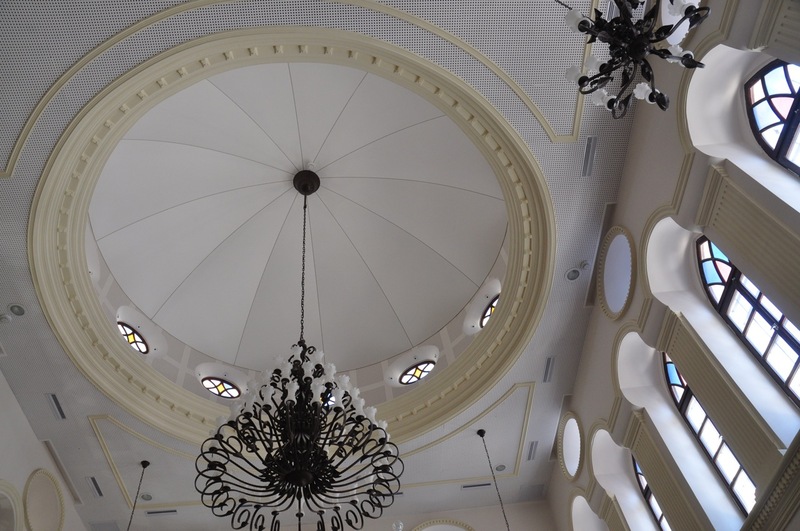 Visitors who are impressed with the architecture and style of the churches in the Holy Land often ask to see similar synagogues. 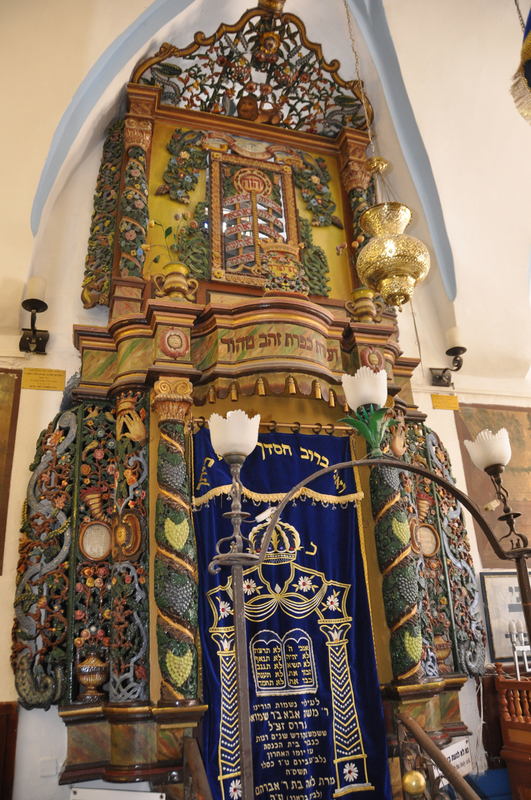 When in Tzfat it’s worth visiting some of the synagogues. The synagogue was built in the sixteenth century on the northern edge of the Sephardic neighborhood by Spanish exiles who had emigrated from Gerigos, Greece. Kabbalists, mostly followers of Rabbi Moshe Cordovero frequented the synagogue and in 1570 Rabbi Isaac Luria (known by his acronym “the Ari”) joined them – for a short two years until his death. On the Eve of Sabbath, they walked to a nearby field, the Hakal Tapuchin, (apple orchard) to welcome the Sabbath bride to the melody of Lecha Dodi written by Rabbi Shlomo Alkabetz. 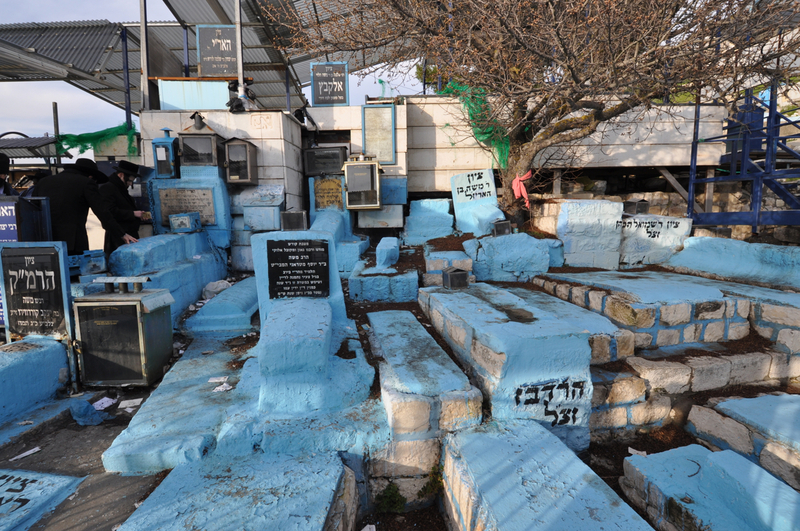 Cordovero, the Ari, Alkabetz and other kabbalists are buried in the cemetery, their graves covered in bright, sky blue paint. In the eighteenth century, a large group of Hasidim from Europe arrived and the synagogue began to be called “the Ashkenazi Ari Synagogue.” It was destroyed in the earthquake of 1837, and rebuilt in 1857. Notice the inscription in Hebrew that appears above the entrance, which in Hebrew numerology is equivalent to “and My Temple shalt thou revere”. The Holy Ark was carved from olive wood by a craftsman from Galicia, Poland, in the style of the synagogues of Eastern Europe. The craftsman was a non-Jew who was unaware of Judaism’s adherence to the second commandment against graven images. At the top of the ark he placed a human face – this was transformed into an anthropomorphic image of a lion, alluding to the acronym Ari, which means lion. 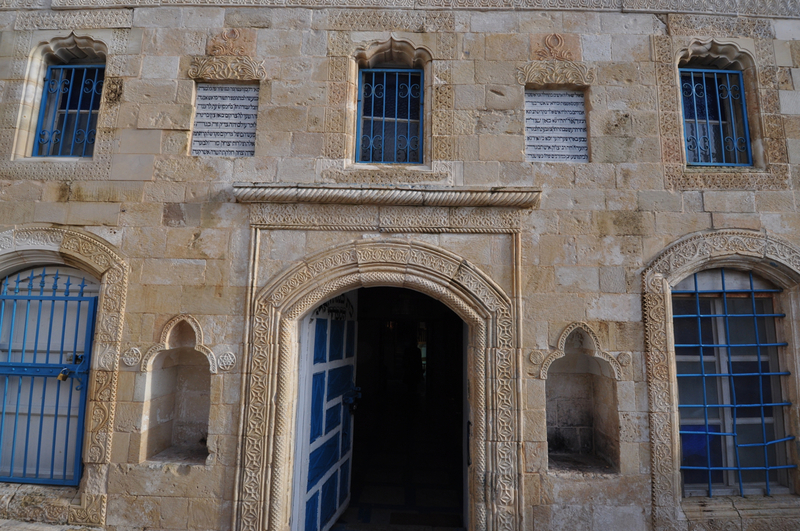 Down by the cemetery there is another synagogue, Eliyahu HaNavi, the oldest synagogue in Safed that historical sources tell us existed as early as 1522 and was used by North African Jews. The Ari frequently prayed in this synagogue, preferring this location over others because of the view of Mt. Meron and the tomb of Rabbi Shimon Bar Yohai. 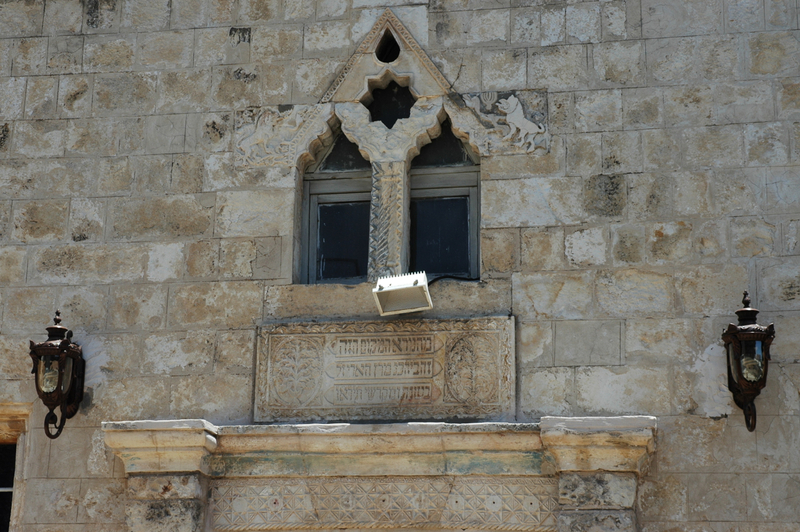 The Ari liked to sit in a little alcove on the eastern side of the synagogue studying Kabbalah, and that while he was absorbed in his studies, the prophet Elijah appeared to him. Most of the structure was destroyed in the massive earthquakes that struck Tzfat in 1759 and 1837. In 1840, the Italian Jewish philanthropist Yitzhak Guetta donated money for the renovation of the synagogue. The only synagogue in Tzfat which was not destroyed by either the 1759 or the 1837 earthquake is the Alsheich synagogue named after Rabbi Moshe Alsheich, one of the foremost kabbalists of his day. He gave weekly sermons on the Torah portion of the week at the synagogue with kabbalistic commentaries to which the Ari and Rabbi Yosef Karo attended. The Alsheich oversaw the construction of the synagogue which was erected in the style of 16th century Sephardic synagogues but had no women’s gallery. 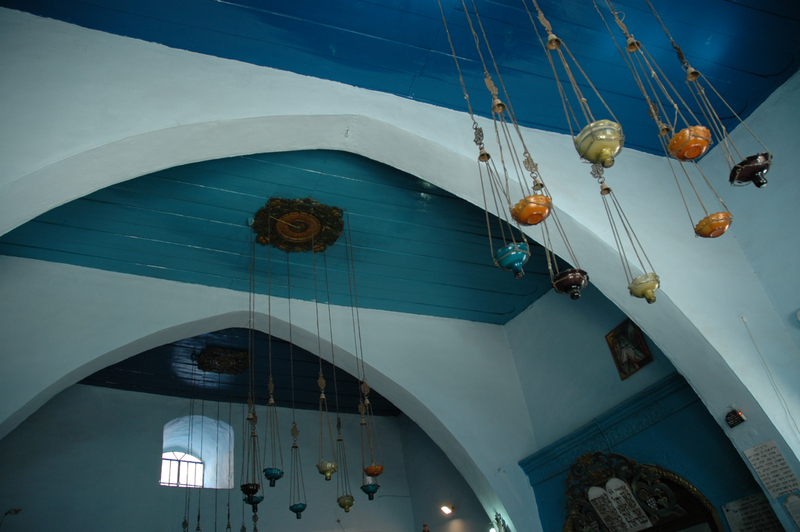 After 1759, the synagogue was renovated and the workmen inserted beams and peaked arches in the style of the Bukharan Jews of Samarkand which enabled it to withstand the devastating earthquake of 1837. One of the most valued items in the synagogue is the Torah scroll cover inscribed with the year 1434. The synagogue is named after the fifteenth century kabbalist, Rabbi Isaac Abuhav, who is considered one of the great sages of Castile, Spain. Tradition states that Abuhav, who never left Spain, designed the synagogue and his disciples erected the building when they arrived in the 1490s after their expulsion from Spain. Another legend claims that Abuhav came to Rabbi Ohana, a kabbalist from Fez, Morocco in a dream and asked for his help to transport the synagogue miraculously from Spain to Safed. The kabbalists gathered together at midnight in the House of Study, after fasting and immersing in the mikve (ritual bath) – in Toledo, a whirlwind with frightening power ripped up the synagogue from its foundations and set it down in an empty field in Tzfat. The synagogue has three Arks on its southern wall, the only wall left standing in the 1837 earthquake. The bima is in the center and the benches for the congregation are arranged around it, as was customary. 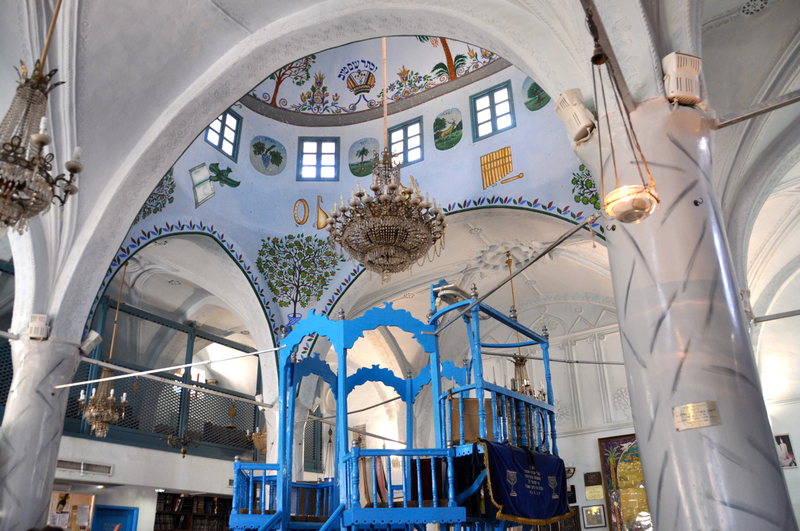 The interior of the synagogue dome is decorated with paintings of musical instruments that were used in the Temple in Jerusalem. The crowns mentioned in Pirkei Avot 4:13 represent the crowns of Torah, the priesthood, royalty, “a good name” and a crown unique to Tzfat, the crown of redemption. In keeping with the numerological tradition of Kabbalah, the design of the synagogue has numerical significance: 1 bima, 3 Arks, 4 central columns that represent earth, water, air and fire, 6 steps up to the bima, 10 windows in the dome represent the Ten Commandments and there are pictures symbolizing the 12 tribes of Israel. In the rightmost ark, is a Torah scroll that is 650 years old, written by Rabbi Abuhav, conceivably the oldest Torah scroll still in use. It is only taken out for reading three times a year: Rosh Hashanah, Yom Kippur and Shavuot. Among Abuhav’s pupils was Rabbi Ya’acov Beirav, who later moved to Tzfat and became one of its foremost sages. It may have been Beirav who brought the Torah scroll to Tzfat. Another Torah scroll in the Abuhav Synagogue is the scroll of Rabbi Ohana. This entry was posted in Architecture, Synagogue and tagged Ari, Galilee, Kabbalah, Safed, synagogue, Tsfat, Tzfat on May 2, 2013 by Shmuel Browns. 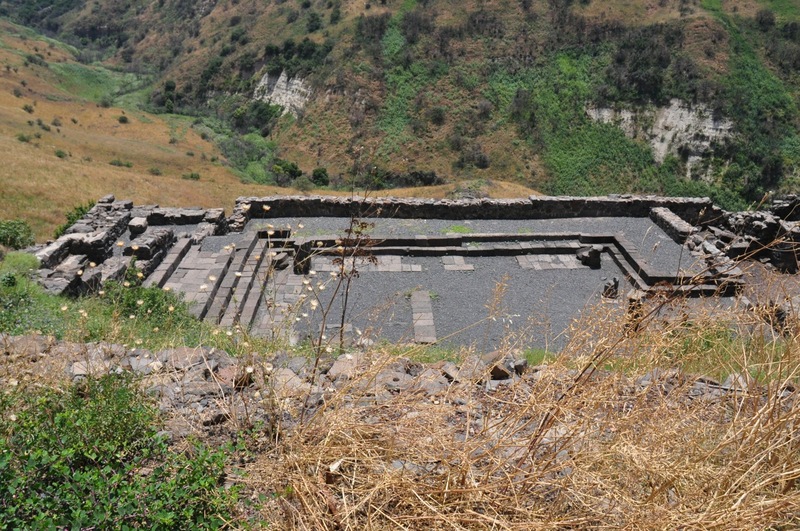 Gamla is both a nature reserve and archaeological site making it a great place to visit. 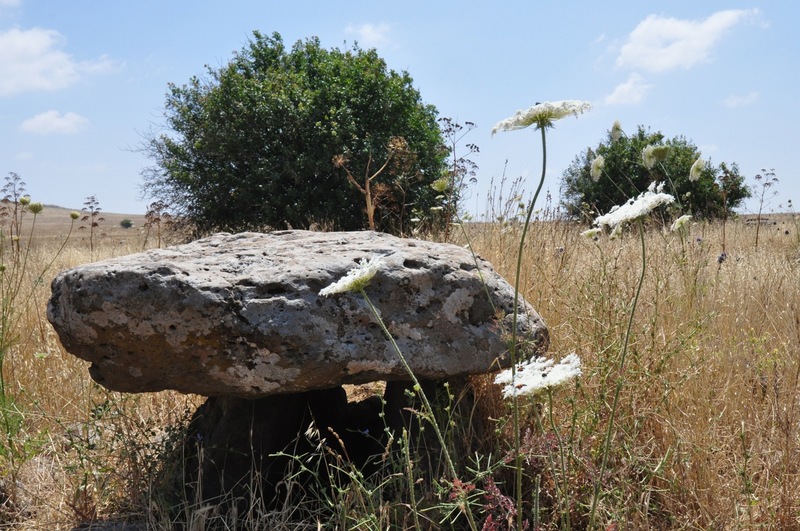 We started with an easy hike, through a field of dolmens, prehistoric megalith tombs erected in the early Middle Bronze period about 2200BCE. A dolmen is made up of three large basalt stones, one lying on two other stones standing vertically. 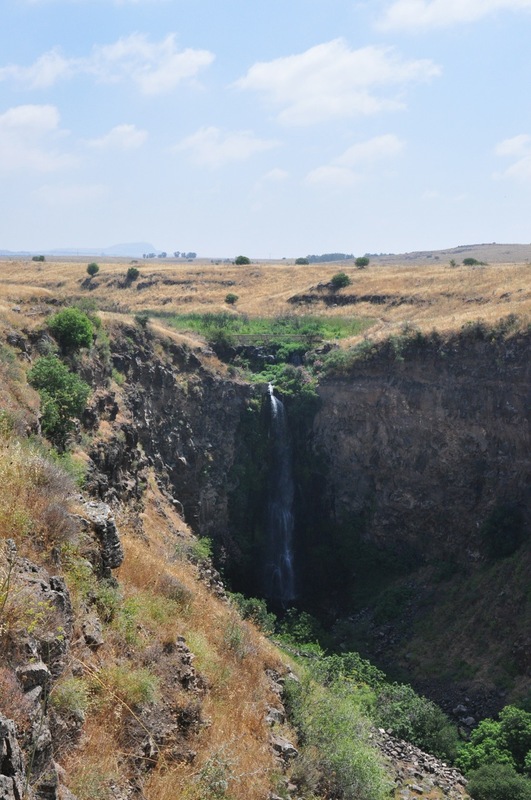 The hike takes us across a wooden bridge to the other side of Nahal Gamla for a view of the waterfall, at 51m the highest in Israel. Take the trail past a Byzantine town to the Raptor lookout – the nahal is home to a large nesting population of Griffon vultures (that Israel has successfully resettled there) who did a fly past for us over the valley, it’s an incredible sight to see them gliding on the thermals. The ancient city is situated on a steep hill (a horst like Masada) shaped like a camel’s hump, from which it derives its name (gamal means ‘camel’ in Hebrew). Jews inhabited it from the last quarter of the 2nd century BCE, and it was annexed to the Hasmonean state under Alexander Jannaeus in about 81BCE. Josephus Flavius, commander of the Galilee during the Jewish Revolt against Rome fortified Gamla as the main stronghold on the Golan. It’s fascinating to compare Gamla, a city and one of the first to stand against Vespasian’s legions with Masada, a fortress and the last to fall to the Romans. Josephus provides a detailed description of the Roman siege and destruction of Gamla (like at Masada). Vespasian and his son Titus led the X Fretensis, XV Apollinaris and V Macedonica legions against Gamla, built a siege ramp in an attempt to take the city but were repulsed by the defenders. Only on the second attempt did the Romans succeed in breaching the wall at three different locations and invading the city. There they engaged the Jewish defenders in hand-to-hand combat up the steep hill. Fighting in the cramped streets from an inferior position, the Roman soldiers climbed onto the roofs that subsequently collapsed under the heavy weight, killing many soldiers and forcing a Roman retreat. The legionnaires re-entered the town a few days later, eventually beating Jewish resistance and completing the capture of Gamla. According to Josephus, some 4,000 inhabitants were slaughtered, while 5,000, trying to escape down the steep northern slope, were either trampled to death or fell or threw themselves into the ravine (perhaps exaggerated by Josephus, the number of inhabitants has been estimated at less than 4,000 – at Masada 960 lost their lives). Abandoned after its destruction, Gamla lay in ruins for almost 2000 years and was only identified in 1968 by Itzhaki Gal who was doing an archaeological survey of sites in the Golan after the Six Day War. It was excavated by Shemaryahu Gutmann (who did the original survey at Masada and who excavated there with Yigal Yadin) and Danny Syon for 14 seasons from 1976. 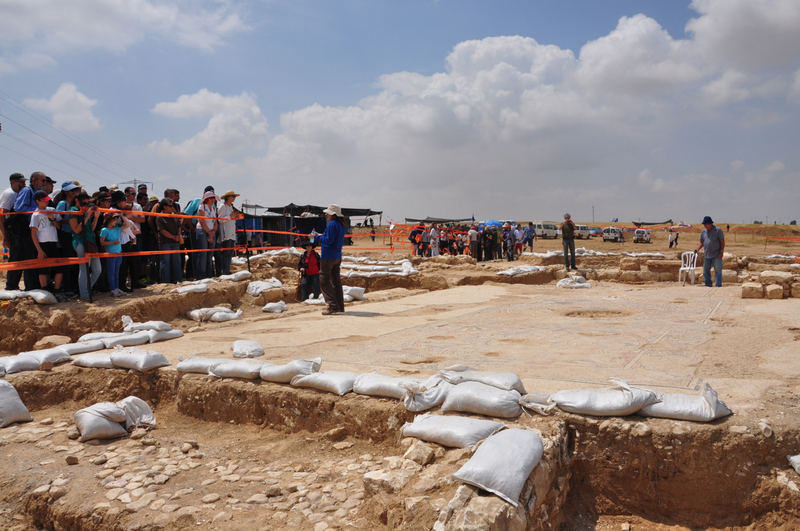 The excavations uncovered 7.5 dunam, about 5% of the site, revealing a typical Jewish city. The Gamla excavations revealed widespread evidence of the battle, about 100 catapult bolts, 1600 arrowheads and 2000 ballista stones, made from local basalt, 200 artifacts of Roman army equipment, quantities unsurpassed anywhere in the Roman Empire. Most were collected near the wall, placing the heavy fighting in the vicinity of the wall and the Roman siege engines to the northeast of the town. Only one human jawbone was found during the exploration of Gamla, raising a question about what happened to the bodies of the Jewish defenders (like Masada). A tentative answer is suggested by archaeologist Danny Syon – he suggests that the dead would have been buried at nearby mass graves that have yet to be found (as at Yodfat). One of the most interesting finds is the remains of a typical “Galilean” style synagogue inside the city walls, with rows of columns, tiers of side benches, heart-shaped corner pillars and an alcove for Torah scrolls in the northwest corner. A mikveh (ritual bath) was found nearby. Interesting to compare this to the synagogue found at Masada. The synagogue is thought to date from the late 1st century BCE making it one of the oldest synagogues in the world. Also found were six coins minted at Gamla during the Revolt, with the inscription “For the redemption of Holy Jerusalem” in a mixture of paleo-Hebrew and Aramaic that shows that the defenders of Gamla saw their fight against the Romans as no less than a struggle for national independence. The Golan Archaeological Museum in nearby Katzrin displays artifacts from Gamla and other sites on the Golan and a moving film about Gamla – definitely worth a visit. This entry was posted in Archaeology, Birding, Hiking, Nature, Synagogue, Travel and tagged Byzantine, hike, Hiking, postaweek2011, restaurants, synagogue, vultures on June 14, 2011 by Shmuel Browns. 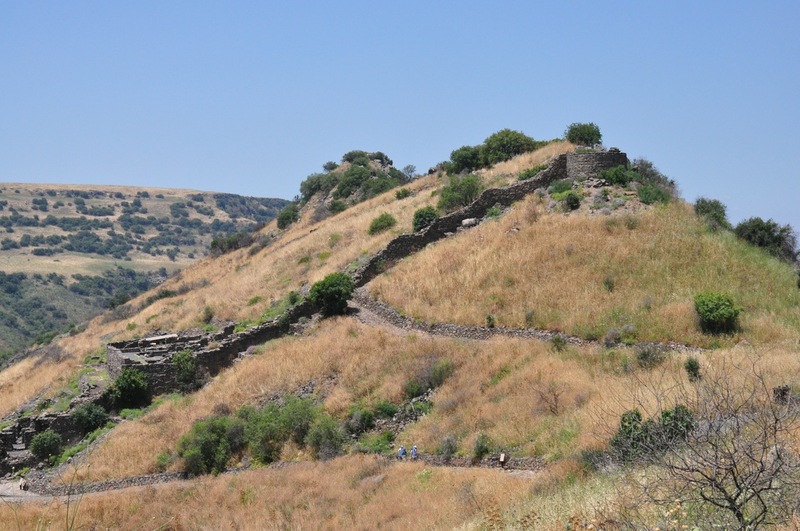 About 45km south of Jerusalem in the Ella valley, where David fought Goliath, are the ruins of an ancient agricultural settlement beginning in Iron age II, Hirbet Midras. 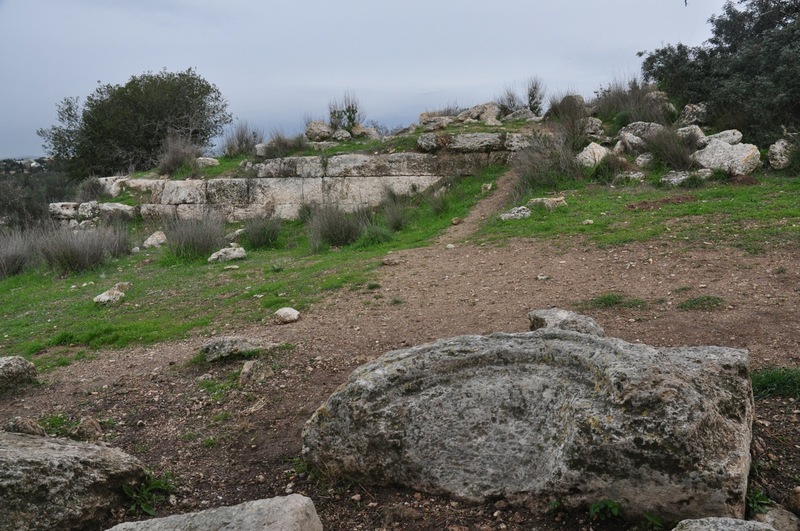 With the recent discovery of a Byzantine church thought to be the burial place of the prophet Zechariah* people may lose sight of the fact that the site also contained a large, important Jewish settlement that dates from the Second Temple period (3rd century BCE) until its destruction during the Bar Kokhba uprising. The site is part of a JNF park and nature reserve covering about 5000 dunam with typical Mediterranean woodlands, Kermes oak, Atlantic pistachio, terebinth and buckthorn. When I visited there were pink cyclamen (rakafot רקפות), red anemones (kalaniot כלניות) and Common Asphodel in bloom. With the recent rains, hyssop (zatar) had come up. 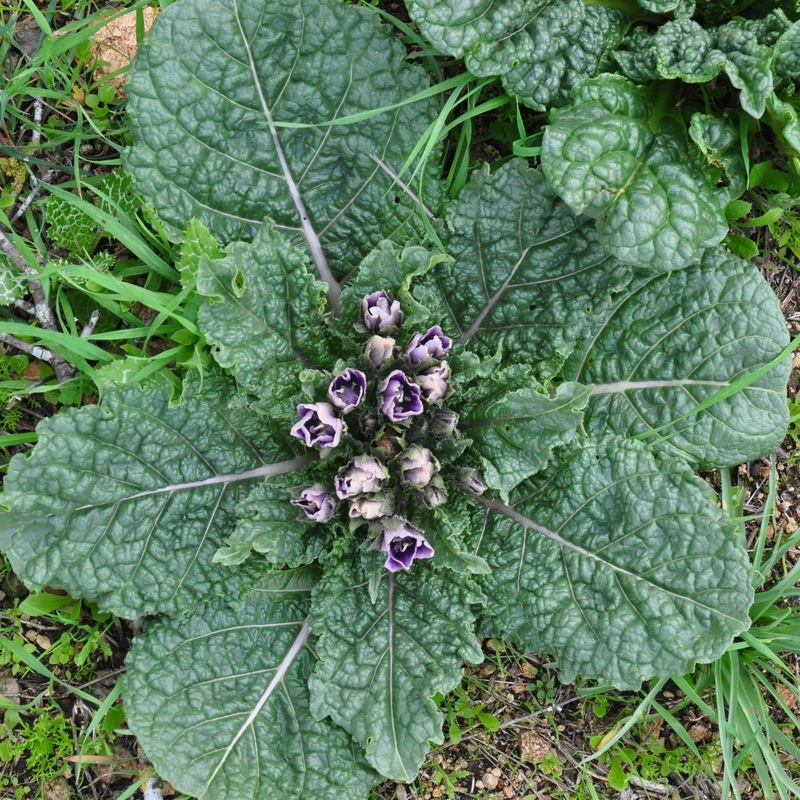 There were also many clumps of mandrakes (dudaim) in bloom, the fruit, which is reported in the Bible to be an aphrodisiac, will be ready late summer, at the time of the wheat harvest. Among the remains at the site are various buildings, agricultural installations and an extensive complex of caves and tunnels, including a columbarium and tombs. Cut out of the soft limestone is a bell cave with square and triangular niches carved in the walls that was used as a columbarium (dovecote). The pigeons were raised for food and the dung used as fertilizer. Other bell caves were used for storage and hiding during the Bar Kokhba revolt – a collection of chambers were quarried and connected to each other by tunnels. For those who like spelunking you can walk and crawl (about 20 minutes and you’ll need a flashlight and a map) from the bell cave through a circular maze of tunnels through some dozen chambers that takes you back to where you started. At the top of the hill with a great view of the coastal plain is a stepped, pyramid-shaped structure of dressed stone, the only one of its kind in Israel. The base is about 10 meters and the present height is 3.5 meters but 3 rows of stones are missing bringing the original height to 5 meters. 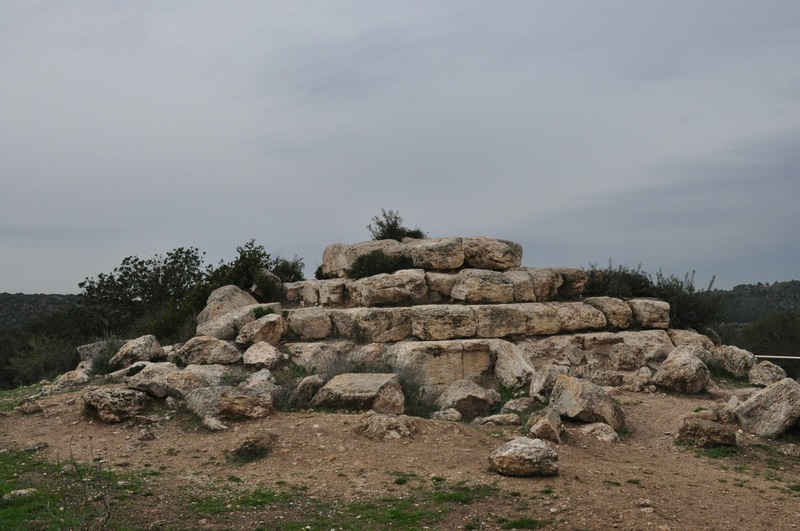 This structure is a nefesh or monument marking a Jewish burial cave. There is a wall of dressed stones up the hill near the stepped pyramid and nearby part of a niche which leads scholars to identify the building as a 4th century synagogue. On the way back down you will pass a system of subterranean burial chambers cut in the limestone. The original opening of the cave was from a square patio, the tomb opening was sealed by a large stone disc that rolled on a track in the rock. Nearby on the western side of highway 38 is a site with Roman milestones from the third century CE, from the days of Marcus Aurelius, with inscriptions of one of the caesars names (Septimius Severus) and his achievements. *According to Jewish and some Christian traditions the burial place of Zechariah, along with Hagai and Malachi, the last three Hebrew prophets who are believed to have lived during the 5th-6th centuries BCE is in a large catacomb on the Mount of Olives (31.783333°N 35.250833°E). Archaeological research shows that the complex dates from the 1st century BCE, when this style of tombs came into use for Jewish burial. 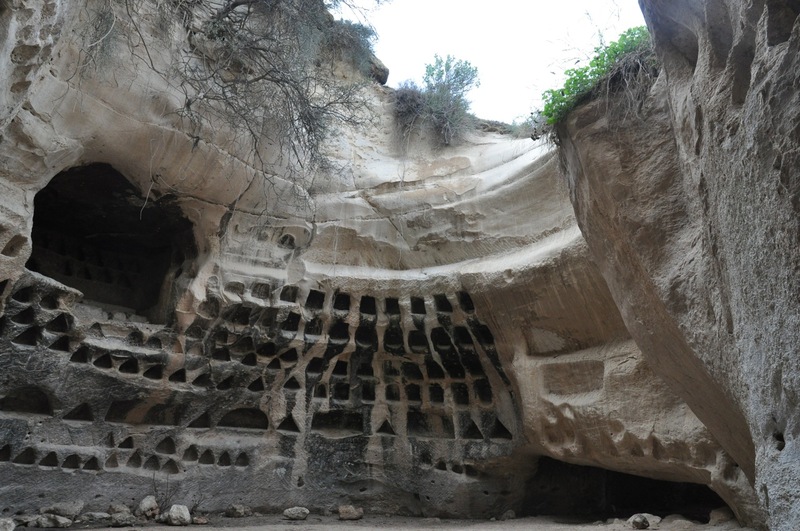 Some Greek inscriptions discovered at the site suggest the cave was re-used to bury Christians during the 4th and 5th centuries CE. 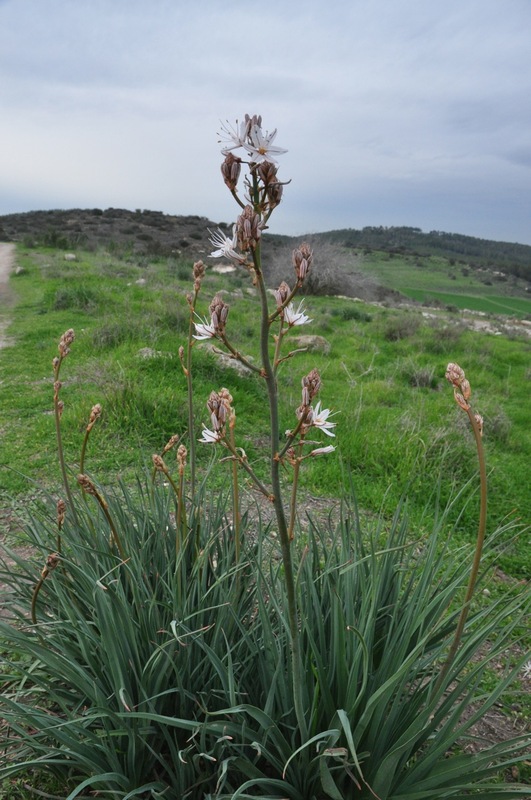 This entry was posted in Archaeology, Nature, Wildflowers and tagged family hike, Khirbet Midras, monument, nefesh, post, postaweek2011, synagogue, Tomb, Zechariah on February 7, 2011 by Shmuel Browns. In 1867 a courtyard between Cotton Merchants’ Gate (Bab al-Qattanin) and the Gate of the Chain (Bab al-Silsileh) and less than 80 meters from the Western Wall was purchased from the Muslim Khaladi family* by the Hungarian Jewish community. They founded a kollel, called Shomrei Ha’Chomot (Guardians of the Walls) and a yeshiva known as Or Ha’Meir and studied Torah around the clock in 3 shifts. After a visit by Rabbi Yitzhak Ratsdorfer, a Belz Hassid and diamond merchant in 1891, they built two synagogues, Beit Yitzchak and Ohel Yitzchak, financed by and named for him. 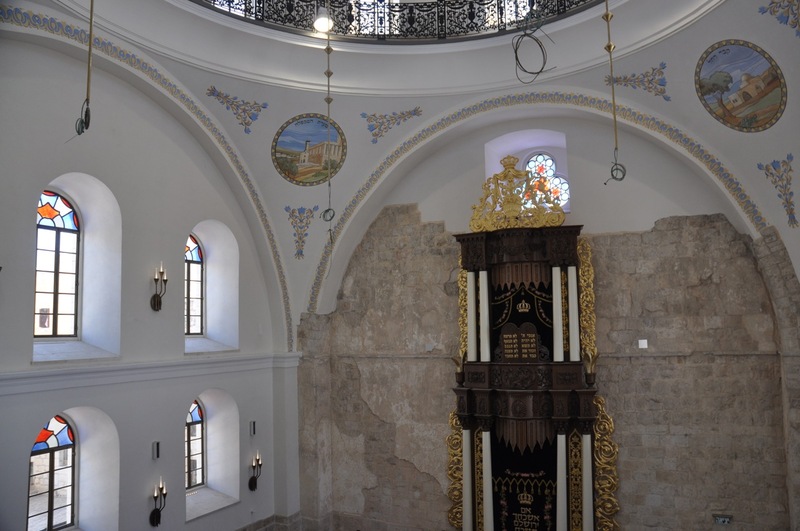 The magnificent synagogue was completed in 1904 and was on a par with the more famous Tiferet Israel and Hurva synagogues in the Jewish quarter. In 1938 because of the Arab riots the site had to be abandoned and the community relocated to Mea She’arim. During the 19 years of Jordanian Legion, the synagogue was looted and vandalized until it was a ruin, the story of more than 50 Jewish religious institutions in the Old City. The site lay deserted until about 15 years ago, when Moskowitz bought it and financed the synagogue’s reconstruction and a comprehensive archaeological dig. In cooperation with the Israel Antiquities Authority who did the research to find old photographs and drawings of the site (I saw similar detailed documentation prepared by the IAA for the renovation of a building in Akko that will become the new Effendi Hotel) they reconstructed the building over a 10 year period using remnants of the destroyed building found at the site whenever possible. In the excavation begun in 2004 they found three steps dating back to the Second Temple period going east towards the Western Wall suggesting a monumental staircase leading to Warren’s Gate, the closest entrance to the Holy of Holies (I’ve heard that the synagogue and staircase have been connected to the Western Wall tunnels). Every historical period was represented but a major discovery was a giant public bathhouse from the Mameluke period (14th C), which lies below the entire site. According to IAA archaeologist Yuval Baruch, this is the most complete relic of the Mameluke period ever discovered in Jerusalem. * Not far from the synagogue, along Bab al-Silsileh street in a 13th C Mameluke building is the Khalidi Library, the largest and finest private Palestinian library, and one of the largest private collections of Islamic manuscripts in the Arab world. Some of these are handwritten, one of a kind manuscripts and even autograph works written by hand by the original author (umm in Arabic). One such umm dated 1201 is a very richly decorated makrumah, or presentation copy, gilded with floral and geometric motives, a personal horoscope and family tree prepared for Salah al-Din Yusuf ibn Ayyub sultan of Egypt and Syria who defeated the Crusaders. The library reading room is housed in the turbah, or burial place, of Amir Husam al-Din Barkah Khan and his two sons. Barkah Khan, who died in 1246, was a military chieftain of Khwarizmian origin who fought in Syria and Palestine in the 1230’s and 1240’s. His daughter was married to the formidable Mameluke sultan Baybars (1260-1277), who relentlessly fought the Crusaders. The two pairs of lions at Lion’s Gate are the symbol of Baybars. This entry was posted in Archaeology, Architecture, Jerusalem, Synagogue and tagged Baybars, Gate of Chain, historical renovation, Hurva synagogue, Old City, postaweek2011, Saladin, synagogue on January 14, 2011 by Shmuel Browns. I’m often asked by people who are planning a trip to Israel what they should do if they have a couple of days to see and experience Jerusalem. Of course, there are many answers, it really depends on what you are interested in. Assuming that this is your first visit, you’ll probably want to start in the Old City so here are my recommendations – note some sites charge an entrance fee. First, drop by the Tourist Information Center at Jaffa Gate, in the Old City and get a free map and a list of sites to see; say hi to Jennifer, she’ll help by marking sites on the map for you and answering your questions. Then walk around, exploring the 4 Quarters, Armenian, Jewish, Muslim and Christian. Another possibility is to take the Ramparts Walk starting at Jaffa Gate where you actually walk on the walls built in 1537 by the Ottoman Turkish sultan, Suleiman the Magnificent – looking in gives you a birds-eye view of the Old City, looking out gives you a view of the new city. In terms of churches, I would visit the Church of the Agony/All Nations and the Garden of Gethsemane outside of the city walls, re-enter the Old City at Lions Gate, visit the Church of Santa Anna, a Crusader church with incredible acoustics (try singing Amazing Grace or other liturgical melody). Continue and you will come to Station I of the Via Dolorosa, follow the Via Dolorosa counting 8 stations to the Church of the Holy Sepulcher, the holiest site to Christianity, where Jesus was crucified and buried and according to Christian tradition rose again, stations IX to XIV are at the Church. Walk through the Arab shuq and take a right at the Cardo to get to the Jewish Quarter. Visit the Wohl archaeological museum to get a feeling for Jerusalem in the Second Temple Period, in the time of Herod and Jesus. If you are interested in more archaeology, then visit the southern wall excavations at the Davidson Center; there is also a movie that describes life at that time. Visit the Western Wall, the holiest site to Judaism, write your prayer on a paper and tuck it into a crack in the stones of the wall. Try to reserve a Western Wall Tunnel tour in advance, either on their website (if you know some Hebrew) at http://english.thekotel.org/VisitorInfo.asp?id=1 or you can call them at (02) 627-1333 between 8:30-17:00. It’s worth taking a guided group tour of the City of David – exit the Old City through Dung gate, take a left and then right and the entrance is on your left. If you have “water” shoes and aren’t claustrophobic, you can even walk 45 minutes through Hezekiah’s Tunnel with water up to your knees (you’ll need a flashlight which you can buy at the site or use your cell phone), which is quite an experience. You might want to walk up onto the Haram el Sharif to see the Dome of the Rock and al Aqsa mosque (the third holiest site to Islam) close up (the Muslim Waqf won’t allowed you to enter them unfortunately) but if so you’ll have to do it in the morning and it takes between 1/2 and 1 hour to pass through security at the entrance to the Western Wall Plaza. Make sure you have no religious articles, prayer books or Bibles and no Swiss Army knife, etc. with you – they will be confiscated. The new Israel Museum is open after extensive renovations and it is now much easier to find your way (for more information check out my blog entry) – the Archaeology wing has been completely redone, the Ethnography section has been expanded and called Jewish Life and the Art gallery includes a new section on Israeli art. The museum includes the Shrine of the Book, where the Dead Sea Scrolls and other artifacts from Qumran are on display. From the same period, the Holyland model of Jerusalem is now housed on the museum campus. If the weather is cooperative, walk around and enjoy the sculpture garden. If you’re interested in archaeology, you can also visit the Rockefeller museum (on the same admission, there’s even a shuttle bus) which will get you back to the Old City. The Arab shuq/market and the Mahane Yehuda market are great places to get a feel for Jerusalem. There’s the Ben Yehuda Street pedestrian mall, called the Midrahov, and at the bottom Zion Square and the pubs, restaurants and boutique galleries in Nahalat Shiva. There’s live music at the Yellow Submarine in Talpiot. All this without hiring a guide, but to be fair how about reading my post, Why hire a guide? This entry was posted in Archaeology, Food, Guide, Itinerary, Jerusalem, Travel and tagged free, freebie, Guide, Jerusalem, Old City, Sandemans, synagogue, tour, walking tour on September 1, 2010 by Shmuel Browns. 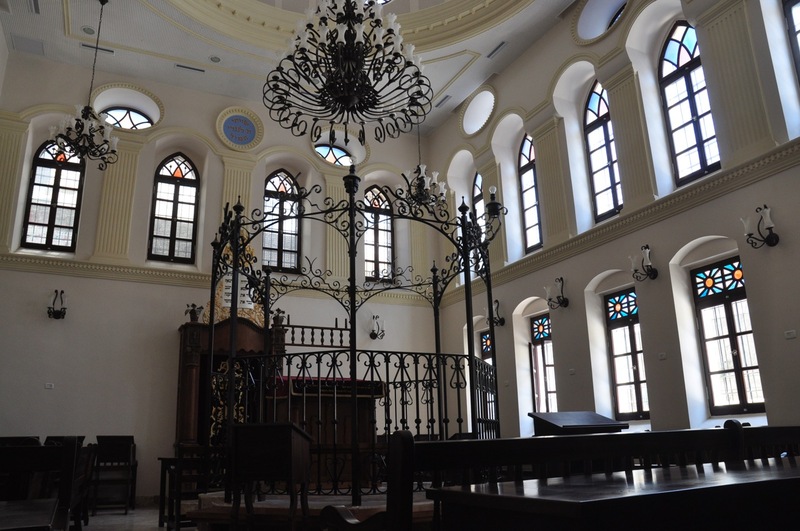 The Hurva was the main Ashkenazi synagogue of the Old City and stood as a landmark for almost 100 years until it was blown up by the Jordanian Legion after they had captured the Jewish quarter on May 27, 1948. It took until 2005 to decide to rebuild the synagogue which was completed in March 2010. I visited it shortly afterwards on a Shabbat morning for services. 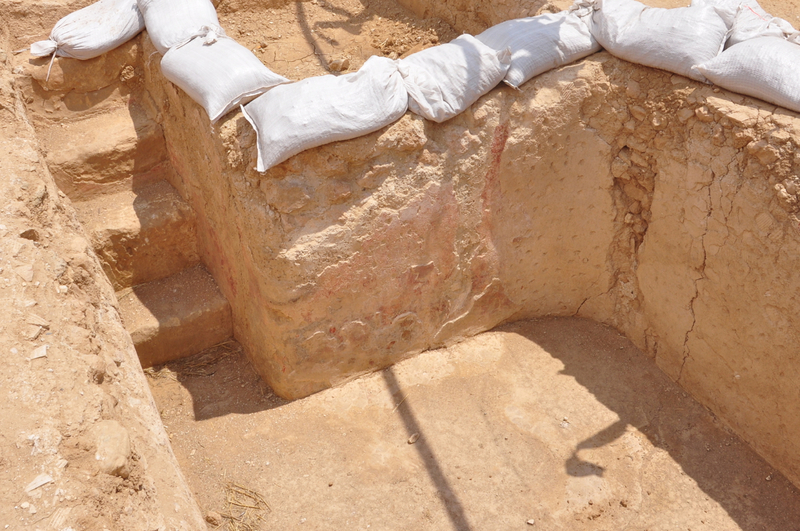 Make sure to go down into the basement (by the washrooms) to see the discovery of a mikveh (ritual bath) from the Second Temple period and an east-west Byzantine street. The second time I joined a weekday tour of the synagogue but we weren’t allowed into the main sanctuary. The guide was only able to show us the inside of the synagogue from the women’s balcony but we were allowed to go up to the roof. The Hurva synagogue is the only site that I am not permitted to bring people (therefore I skip the Hurva and tell its fascinating story outside) – that privilege goes to local guides that work for the Western Wall Heritage Foundation and you have to reserve a place in advance. 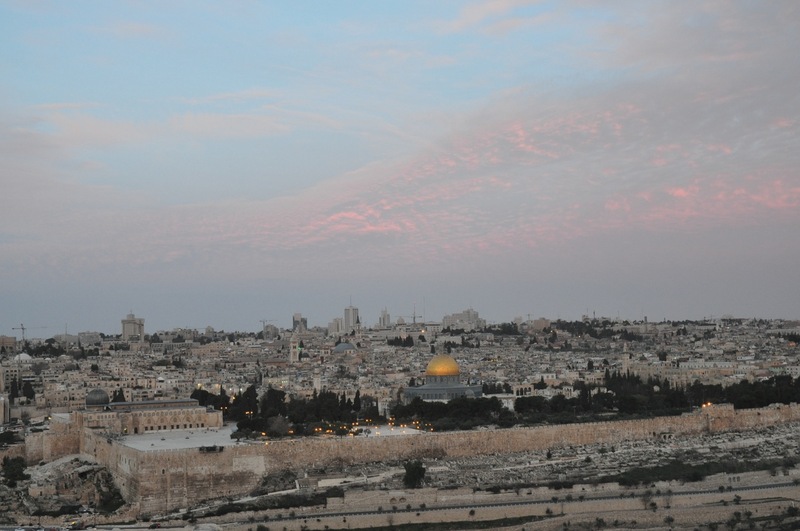 One of the highlights was the view of Jerusalem from the balcony around the dome. Here are 5 photos (shooting clockwise) taken from the height of the dome: 1) looking towards the Christian quarter, domes and bell tower of the Church of the Holy Sepulcher, bell tower of German Church of Redeemer and dome of Alexander Nyevsky Church, 2) view over the Jewish and Muslim quarters with Mount Scopus in the background, 3) Dome of the Rock, Mormon University and Augusta Victoria, 4) dome of Al Aqsa Mosque and Jewish cemetery on Mount of Olives 5) view towards Armon HaNatziv, Mount Zion, Dormition Abbey, Armenian quarter. This entry was posted in Archaeology, Jerusalem, Photography and tagged dome, Hurva interior, postaweek2011, synagogue on May 6, 2010 by Shmuel Browns.